The needle in the network - find it! Find the NEEDLE in the network! Somewhere in the network pictured above hides the word Needle encoded in a rather well known cipher. (You will find examples of the used cipher on PuzzlingSE in several other puzzles.) The task is to find it (and the used cipher). The image alone constitutes the puzzle. It is visual and no information is hidden in its digital representation. The solution requires a cipher to be applied, i.e. the word "needle" is encoded not just visually hidden or obscured. 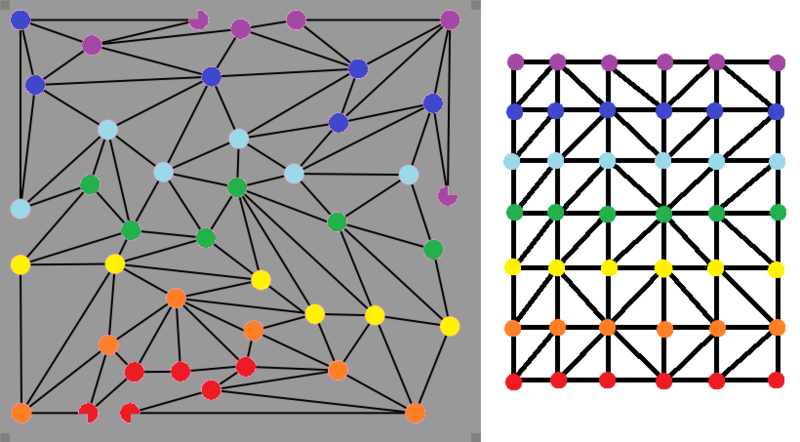 I noticed that four of the nodes of the graph have a quarter missing, and each of those four is missing a different quarter. 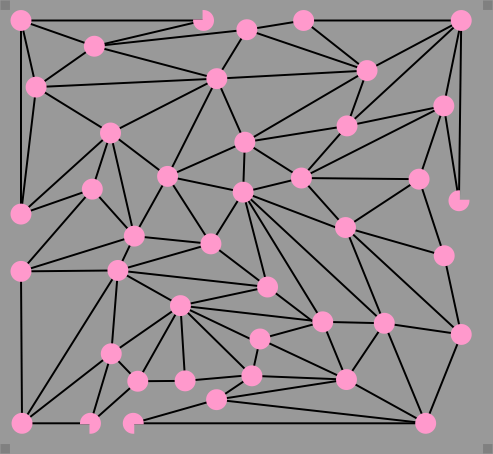 Each row of the grid has 5 cells, which can be assigned a 1 if the diagonal goes from lower left to upper right or a 0 of the diagonal goes from upper left to lower right. Using this method, the rows have binary values of 01101, 00100, 00100, 00011, 01011, and 00100. In base ten, these numbers are 13, 4, 4, 3, 11, 4. Though many people might convert these numbers into letters starting with A=1, this would result in the nonsense word "mddckd". All C programmers know that we should start with A=0, which means the numbers convert to "needle". Is this possibly what you are looking for? Not the answer you're looking for? Browse other questions tagged enigmatic-puzzle visual network or ask your own question. Hidden in plain sight - By what method do these images hide a prime number? What is the cipher behind this circular cyphertext? Dotting the eyes and crossing the teas. But where is the PIN?